February 7: Open House at EWEB Community Room, from 4-7 p.m. 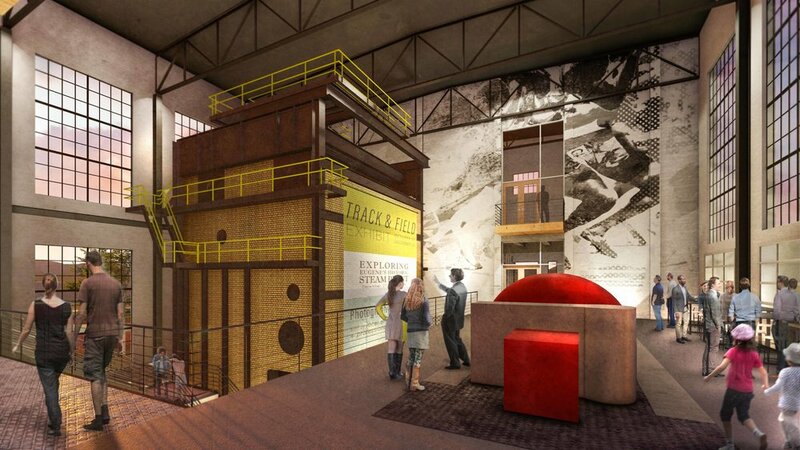 Draft renderings show cultural space featuring historic boiler #1 and the eye-catching red turbine generators. The building would maintain its existing footprint, add cross-laminated timber internally and rise vertically to five stories to maximize views of the river. An outdoor overlook connects the building to the future adjacent Riverfront Park and the river without impeding the bike path. “We have the opportunity to build something that is undeniably ‘Eugene’, that’s infused with our spirit of innovation, that’s at the nexus point on the river between downtown and the university, and that truly invites community participation on multiple levels,” said Mark Frohnmayer. The development team is currently engaged in a robust due diligence process as they develop their full proposal for the Steam Plant’s redevelopment, evaluating the building’s potential and challenges to determine what work needs to be done to bring the building up to code, making it safe for the community to access. The team is also creating their financial strategy, exploring financing sources for the initial redevelopment, and determining what types of uses are needed to make the building financially sustainable long-term. After community outreach, the River Guides, a community advisory committee for the Riverfront Urban Renewal District, will evaluate the proposal using the criteria approved by the Agency Board (City Council). The Agency Board will then consider the proposal, community feedback, and the River Guides’ recommendation when taking action on possible future negotiations with the team, estimated for early April.